“…the Falklands, from their position and internal resources, and being free from natives, will, under a company, thrive much faster than Van Dieman’s Land….”. Captain Edward Goldsmith arrived at Hobart, Van Diemen’s Land (Tasmania) on the barque Wave, on 7th July 1838 via the Cape with general cargo, 16 crew, and 17 passengers who disembarked at Hobart. The Wave was a 343 tons vessel carrying 4 guns. The voyage from Portsmouth, departing on 30th March 1838 to arrival at Hobart took just under four months. Captain Goldsmith departed Hobart in command of the Wave on the return journey for London on 10th October 1838 with six passengers, an experienced surgeon Dr Wilson, and cargo of oil and bone. The Wave having nearly completed her cargo, will positively clear at the Custom House on the 6th, and sail early on the 7th October. Has room for a few bales of Wool, and can accommodate a few passengers. Carries an experienced surgeon. Oct. 10 – Sailed the barque Wave, 343 tons, Goldsmith, master, for London, with a cargo of oil and bone. 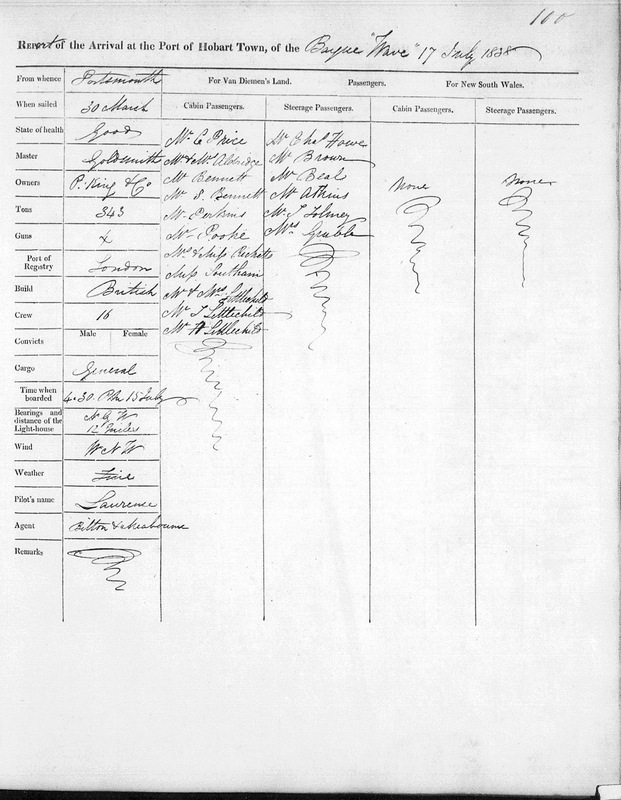 Passengers, Captain Mackenzie and Lady, Mrs. Stewart, Miss Spurling, Mr. Henry Archer, Dr. Wilson. Departure of the Wave. Colonial Times (Hobart, Tas. : 1828 – 1857) Tue 16 Oct 1838 Page 4 Shipping Intelligence. 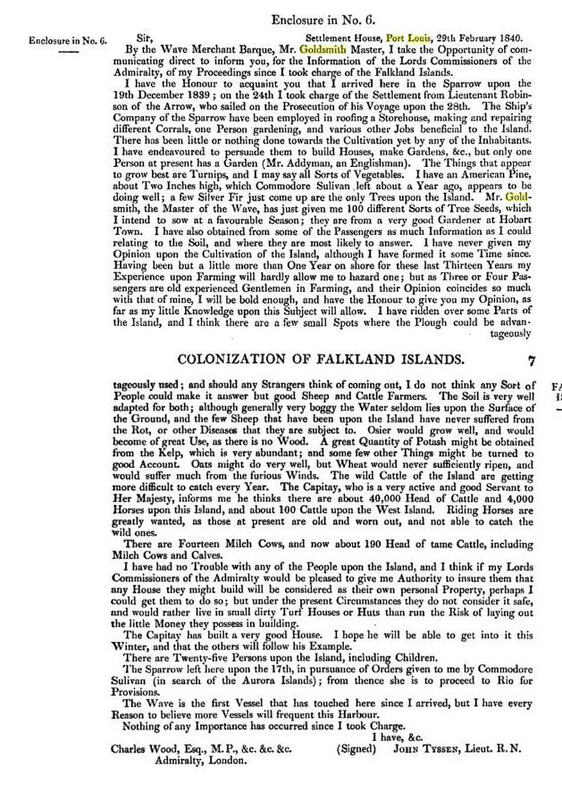 Arriving back in London on 12th February 1839 just in time to attend the funeral of his father Richard Goldsmith snr, Captain Edward Goldsmith wrote this letter, dated 25th March, in support of colonisation of the Falklands. “Captain Langdon’s opinion I fully confirm ; the only obstacle in my mind is the want of timber, which may be overcome. On the 25th of November last, I anchored in Berkeley Sound, a very safe harbour, with plenty of excellent fresh water close to the beach, and abundance of bullocks, horses, and rabbits. One of the latter I brought home, and presented it to Mr. Whitington ; there are about eight sheep on the island, some of which brought lambs during my stay of five days. The soil and climate I consider capable of producing everything that is grown here. I saw peas, potatoes, turnips, &c, all thriving. I cannot imagine how our Government could, for so long a time, have overlooked so valuable and important a place not only as a naval depot, but as a Colony and resort for our numberless merchantmen requiring supplies in that quarter. 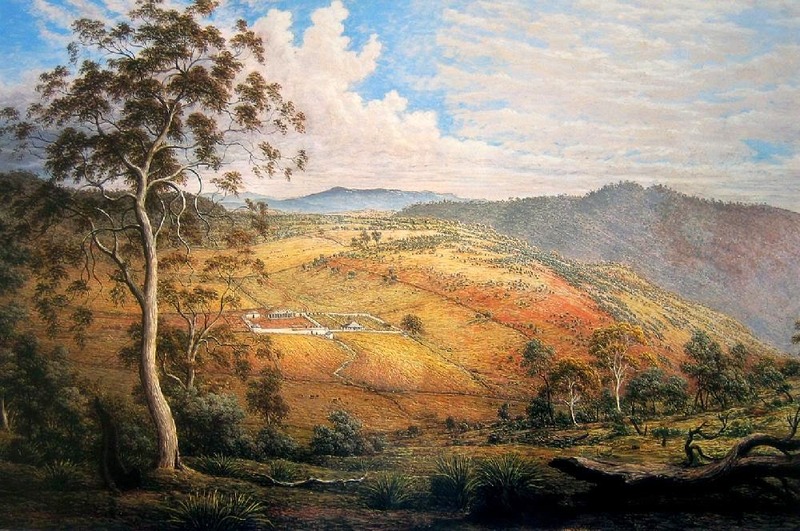 I have made many voyages to New South Wales, and have been compelled to put into Bahia, Pernambuco, and Rio Janeiro for supplies, on which occasions I have always been delayed from three to four weeks. Now the Falkland Isles are in almost a direct line, and about half way between England and the Australian Colonies, and I do not hesitate to assert that a vessel might there be supplied, and get away in twenty-four hours, without any risk or inconvenience. Could they be sure of getting what they might require, I feel assured that they would, on no account, go to any of the ports on the neighbouring coast. I am satisfied that the Falklands, from their position and internal resources, and being free from natives, will, under a company, thrive much faster than Van Dieman’s Land. Sheep will do well, and may be easily imported from New South Wales. 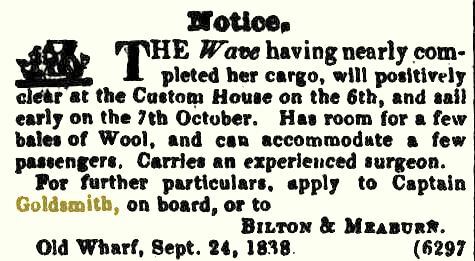 Master of the barque Wave London, March 25, 1839″. 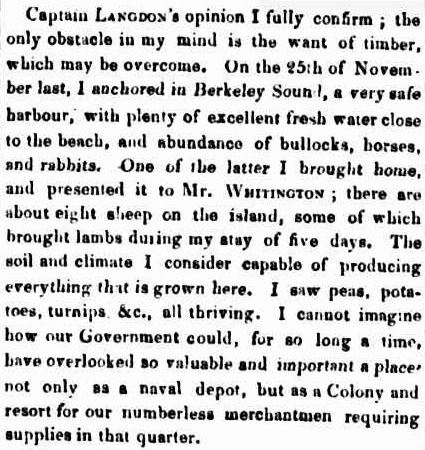 Mr. Whitington says ” a matured ” plan of colonization for these important 44 islands will very shortly appear, supported by merchants and shipowners of eminence, which will insure the confidence of the public. “SETTLEMENT OF THE FALKLAND ISLANDS. 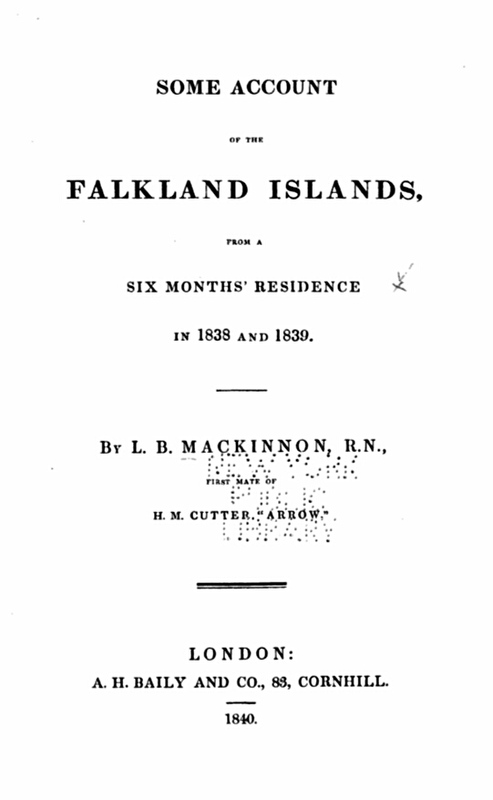 The suggestion that the Falklands become a penal colony similar to Van Diemen’s Land (Tasmania) was put forward to the Colonial Office by Captain William Langdon R.N. as early as 1830. For merchant traders such as Captain Edward Goldsmith, the Falkland islands were of primary importance as a naval depot and resort for merchantmen needing supplies. With probate matters on his father’s estates at Rotherhithe, Surrey and Chalk, Kent left in the hands of his brother John Goldsmith and sister Deborah Goldsmith, Captain Goldsmith arrived back in Hobart, VDL, once more in command of the Wave, on 26th September 1839, where he attended a dinner held at Government House by his close friend, Sir John Franklin (23 October 1839). He departed Hobart on 11th January 1840 bound for London with wool and passengers, intending to anchor at Berkeley Sound East Falkland en route, as stated in his letter. The Wave arrived at Port Louis in late February 1840, the first vessel to do so in the new Crown Colony. According to this optimistic report from Lieut. John Tyssen dated 29th February 1840 (a valid leap year), which Captain Goldsmith duly conveyed on his behalf to the Admiralty, London, one hundred different tree seeds were sourced from a Hobart gardener by Captain Goldsmith as a gift to the settlement where the only other trees ” upon the Island” were one American pine and a few Silver fir. By the Wave Merchant Barque, Mr. Goldsmith Master, I take the opportunity of communicating direct to inform you, for the Information of the Lords Commissioners of the Admiralty, of my Proceedings since I took charge of the Falkland Islands…. Mr. Goldsmith, the master of the Wave, has just given me 100 different Sorts of Tree Seeds, which I intend to sow at a favourable Season; they are from a very good Gardener at Hobart Town…. The Wave is the first Vessel that has touched here since I arrived, but I have every Reason to believe more Vessels will frequent this Harbour. I have, & (Signed) JOHN TYSSEN, Lieut. R.N. The Falklands did not become a penal colony, as it happened. In 1840, the Falklands became a Crown colony and Scottish settlers subsequently established an official pastoral community. Four years later, nearly everyone relocated to Port Jackson, considered a better location for government. 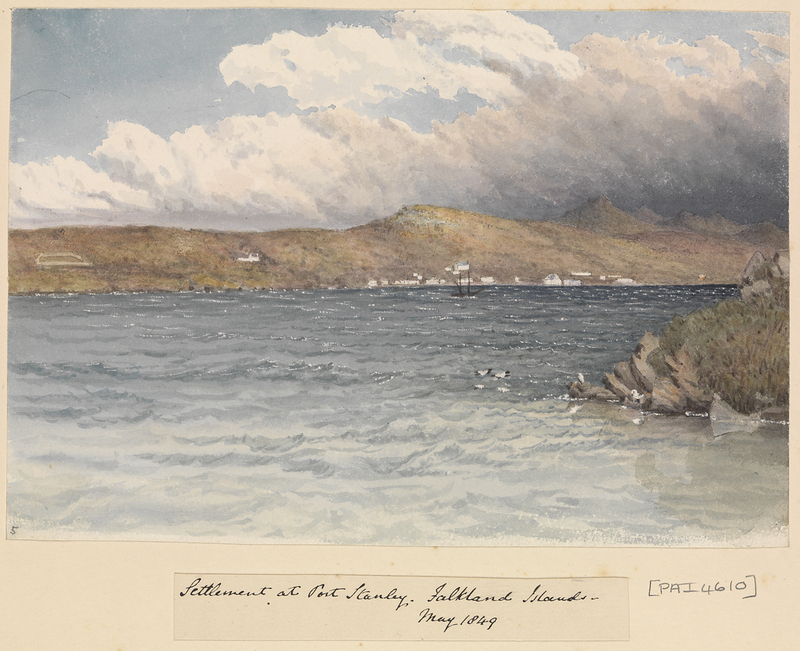 Stanley, as Port Jackson was soon renamed, officially became the seat of government in 1845. Early in its history, Stanley had a negative reputation due to cargo-shipping losses; only in emergencies would ships rounding Cape Horn stop at the port. Nevertheless, the Falklands’ geographic location proved ideal for ship repairs and the “Wrecking Trade”, the business of selling and buying shipwrecks and their cargoes. Aside from this trade, commercial interest in the archipelago was minimal due to the low-value hides of the feral cattle roaming the pastures. Disputes between the US and Argentina continued until 1844 when the US, supporting Britain, questioned the claim that all Spanish possessions had been transferred to the Government of Buenos Aires. The US and Britain declared that Spain had exercised no sovereignty over several coasts to which Buenos Aires claimed to be heir, including Patagonia. An interim Commander to the Islands, Commander Mestivier, appointed by the Buenos Aires government was murdered during a mutiny by his own men, which prompted Captain Onslow of the warship ‘Clio’ to take command, placing the Falklands under British administration. The administration was memorably challenged during Argentina’s ten week occupation in 1982. Economic growth began only after the Falkland Islands Company successfully introduced Cheviot sheep for wool farming, spurring other farms to follow suit. The high cost of importing materials, combined with the shortage of labour and consequent high wages, meant the ship repair trade became uncompetitive. After 1870, it declined as the replacement of sail ships by steamships was accelerated by the low cost of coal in South America; by 1914, with the opening of the Panama Canal, the trade effectively ended. 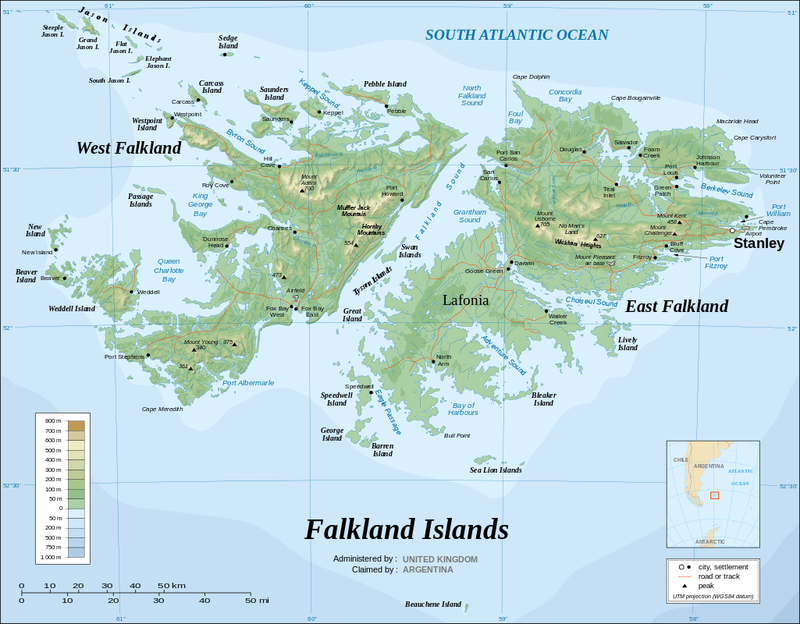 In 1881, the Falkland Islands became financially independent of Britain. The port of Bahia, mentioned in Captain Edward Goldsmith’s letter, was the scene of considerable drama on one of his earliest voyages to Perth, Western Australia as the very young commander of the James, 1830. Seven weeks out on the voyage, he was “compelled” as he says, to berth the James at Bahia on 23 February 1830 for several reasons; the ship was so poorly built its bows needed urgent repairs, was one reason but more significant was the trouble caused by an Irish soldier, Captain Theophilius Ellis of the 1st Royal Infantry (Ireland) Regiment, who complained so emphatically over accommodation arrangements in leaky cabins that on arrival he promptly requested the vessel be condemned, the passengers refunded their money, and another vessel to carry them to W.A, demands which the Consul refused. Goldsmith in turn suggested Ellis pay for the expensive delay, and when they all re-embarked, relations between Ellis and Goldsmith only worsened. Five people had died on the voyage by 4 March, 1830: the cook, only one week out from Ireland; a woman Mrs Stewart who told Goldsmith she blamed the crowded state of the vessel for her poor health; a Mr Smith, employed by the owners of the James, who went ashore at Bahia and refused to return until Goldsmith plied him with alcohol and brought him back on board, only to die a week later; and the wife and child of a Mr Entwhistle. Rations on board were at their minimum. The day after the James arrived finally at the Swan River on 8th May 1830, it was blown ashore and wrecked, along with the brig the Emily Taylor.. Captain Goldsmith’s wife Elizabeth, who was three months’ pregnant when they departed Britain, gave birth twelve days later, on 20 May 1830, to their son Richard Sydney Goldsmith. Read Laughlan Bellingham Mackinnon’s contemporary account which comprehensively covers the physical, historical and biotic features of the Falklands, written during his visit with Captain Sullivan. 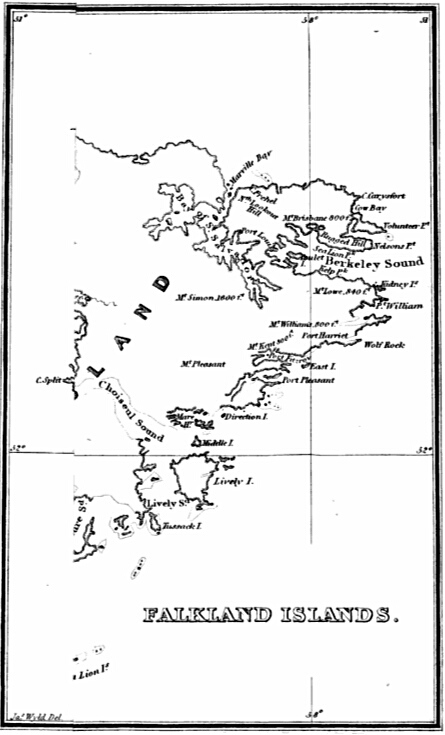 The map shows the coastline of East Falkland with Berkeley Sound as it was known in 1839. Some of Mackinnon’s observations are remarkably similar to those of Captain Goldsmith’s. William Langdon (1790-1879), naval officer and landowner, was born on 6 November 1790 at Montacute vicarage, Somerset, England, the fifth son of Rev. William Langdon. When 13, while at school at Beaminster, Dorset, he became inspired by the career of Admiral Hood (Viscount Bridport), obtained an interview with him and asked for an appointment as a midshipman. A few weeks later Bridport wrote to him directing him to join H.M.S. Weymouth, in which he became a first-class volunteer in April 1804. He sailed in her to Madras escorting East Indiamen. In September 1806 he was present at the capture of a French frigate off Rochefort; in 1806 he was transferred to the Monarch and in August 1807 to the Champion; he saw much action and when only 17 was sent to Plymouth in command of a French prize; in 1810 he joined the Badger and in August 1811 became acting lieutenant in the Ringdove in the West Indies, the promotion being confirmed in November. He was invalided from May 1812 to September 1814. After the peace of Paris, seeing no prospect of speedy promotion, he retired, bought the Lusitania, 245 tons, and took her on a trading voyage to Sydney and Hobart Town, where he first landed in October 1821. On a second voyage he reached Sydney in May 1823. He exchanged the Lusitania for the Hugh Crawford, which reached Sydney in April 1825. 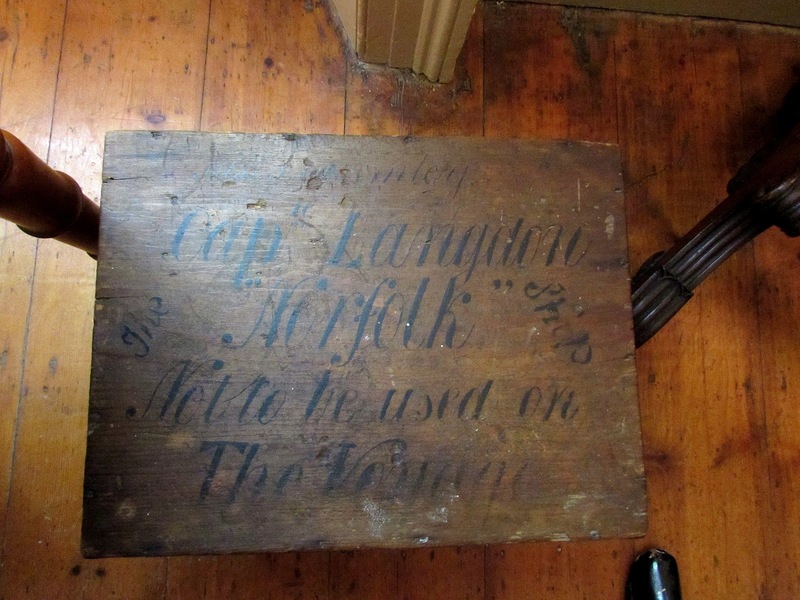 In 1828 he bought the Wanstead and in 1829 the Thomas Lawrie. In November 1822 he was fined £800 for breaking the port regulations by giving a passage from Hobart to England to Thomas Kent. 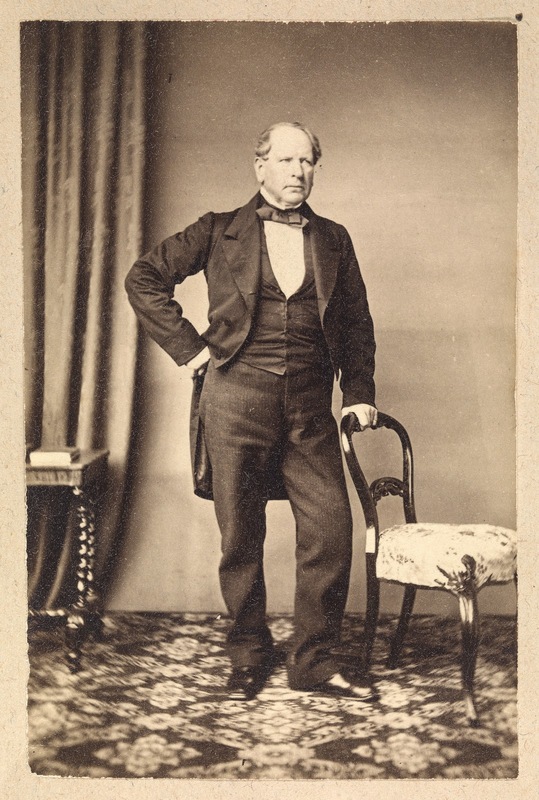 ‘Langdon, William (1790–1879)’, Australian Dictionary of Biography, National Centre of Biography, Australian National University, http://adb.anu.edu.au/biography/langdon-william-2327/text2999, published first in hardcopy 1967, accessed online 22 March 2016. Captain Edward Goldsmith was the paternal uncle of Thomas J. Nevin’s wife, Elizabeth Rachel Day, having married her father’s sister and namesake Elizabeth Day at Liverpool (UK) in 1829. Her father, Captain James Day had served as Captain Goldsmith’s navigator and first mate on several voyages dating back to the 1830s. Most likely she knew of her uncle’s friendship with Captain Langdon, and may have visited Montacute around the time these photographs were taken. 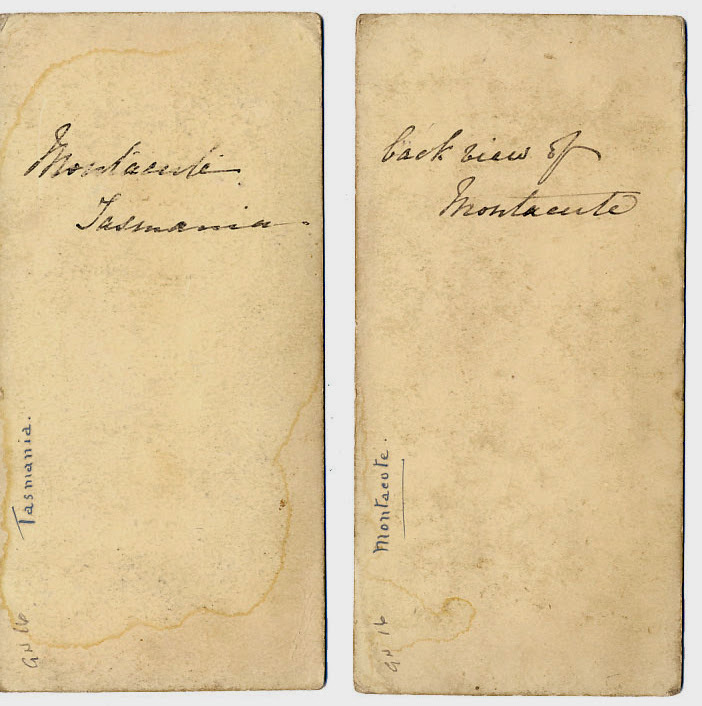 The versos are inscribed in handwriting, with “Tasmania” along the edge of one, which also appears on Thomas Nevin’s photograph of Mary Morrison stamped recto with Nevin’s impress. 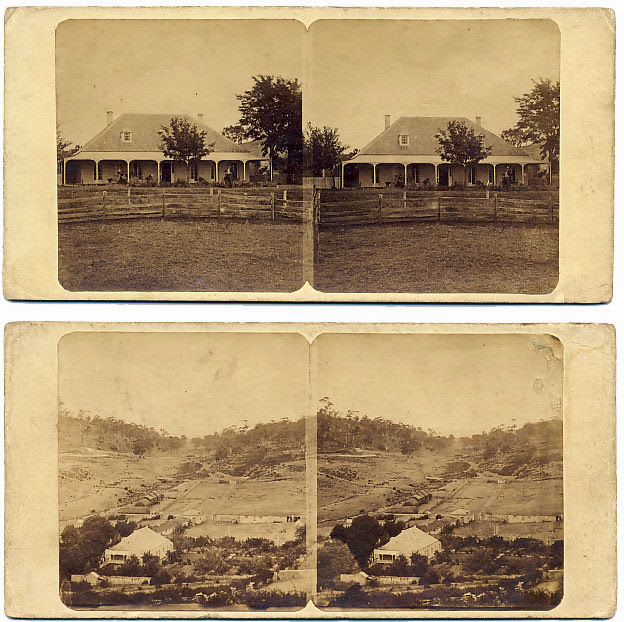 Photographers Samuel Clifford and Thomas Nevin travelled around the island in partnership during the 1860s-1870s, producing prodigious numbers of commercial stereographs. One of their visits on passing through Bothwell was reported at length in The Mercury 26th September 1874.